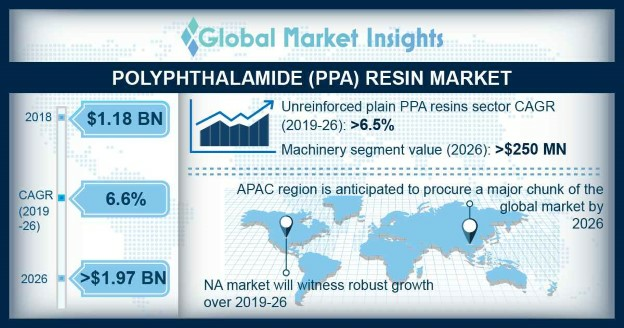 Polyphthalamide Resin Market size was over USD 1.1 billion in 2016 and will grow at a CAGR of 6.6% over the projected period. Polyphthalamide (PPA) is a high-temperature application plastic, which is a combination of aliphatic and aromatic functionalities. It is derived from bio-based dicamethylendiamine and terephthalic acid. These polymers are semi-crystalline in nature and offer high stiffness and strength at elevated temperatures. The base resin of PPA is generally modified by adding glass fiber, carbon fiber, minerals, and a combination of different materials to enhance its properties. PPA resin finds wide applications in under-the-bonnet automotive components, electrical and electronic devices such as LEDs, domestic appliances, and plastic components that are in contact with drinking water, in machinery parts, and in some personal care applications. The automotive industry faces stringent challenges such as replacement of traditional metals with plastics to reduce the cost and weight of the car thereby reducing emissions. Regulations are also in place to improve energy efficiency and extend the car life. Owing to this, constant R&D efforts are made by engineering plastic companies to develop the product to replace metals. PPA plastic is widely recognized in the automotive industry as a metal replacement plastic as it can operate at elevated temperatures of up to 220o Celsius. This unique plastic has an excellent resistance to elevated temperatures and to chemicals and fluids, which make it an ideal choice for under-the-hood automotive applications. This resin can be processed with a wide variety of methods, such as extrusion or injection or blow molding, making it easier to use as compared to rigid metals. In automotive under-the-hood applications, it is used to replace the conventional metal tubing, tubing for brake booster, hoses, plastic for air intake systems, oil filler tubing, hoses for engine cooling, tubing for Selective Catalyst Reduction (SCR), hydraulic brake system, and other fuel line connectors applications. PPA resin is also expected to replace its costly thermoplastic rivals such as PTFE (poly tetrafluoroethylene) and ETFE (ethylene tetrafluoroethylene) in the near future as it can be processed easily and is derived from sustainable bio-based materials. Glass fiber reinforced PPA is the most common product of this plastic, which finds wide applications in the automotive industry. The amount of glass fiber added ranges from 5% to 65% depending on the applications. With the reinforcement of glass fibers in plain PPA resins, physical and chemicals properties, such as stiffness, strength, creep resistance, weight, cost, and temperature resistance, are modified making it fit for high-temperature applications. Mineral-filled resins are used in applications where flatness and dimensional stability are required. Some of the resins are made in different grades such as impact modified and epoxy coated to fit in a wide range of humidity and temperature ranges. Carbon fiber reinforced PPA resin provides exceptional strength and allows lower density, decreasing the weight of the final component. Carbon fiber is used in fuel systems in automotive as it has a high thermal resistance. The choice of adding the percentage of glass fibers, carbon fibers, and minerals to the plain resin depends on the application and stiffness required. The rise in the consumption of regular oil-derived plastics globally in different industries has led to an increase in waste products and Volatile Organic Compounds (VOC), forcing the industry to use sustainable plastics (i.e., derived from bio-based sources). Automotive OEMs have been taking efforts to lower the average weight of a car by almost 200 kg by 2025 owing to the rise in CO2 emissions and stringent environmental laws and regulations globally. Engine downsizing and the use of limited space for design without compromising on comfort and safety are some of the design challenges that OEMs face today. The future of the automotive industry will be to use sustainable plastics in almost every component as it will reduce the overall weight and improve efficiency figures. Automotive OEM giants, such as Audi, BMW, Toyota, Hyundai, and Honda, have already incorporated PPA plastic in their cars. The Rilsan HT PPA developed by Arkema has been used by Volvo, Daimler, Mahindra, Ferrari, and Maserati in tubing systems globally. This product is made from about 70% bio-based material and is six times lighter than steel. The report includes the market analysis of different products that are reinforced with plain PPA resins. The segmentation is done on the basis of glass fiber reinforced, mineral-filled, carbon fiber reinforced, hybrid, and plain unreinforced resins. 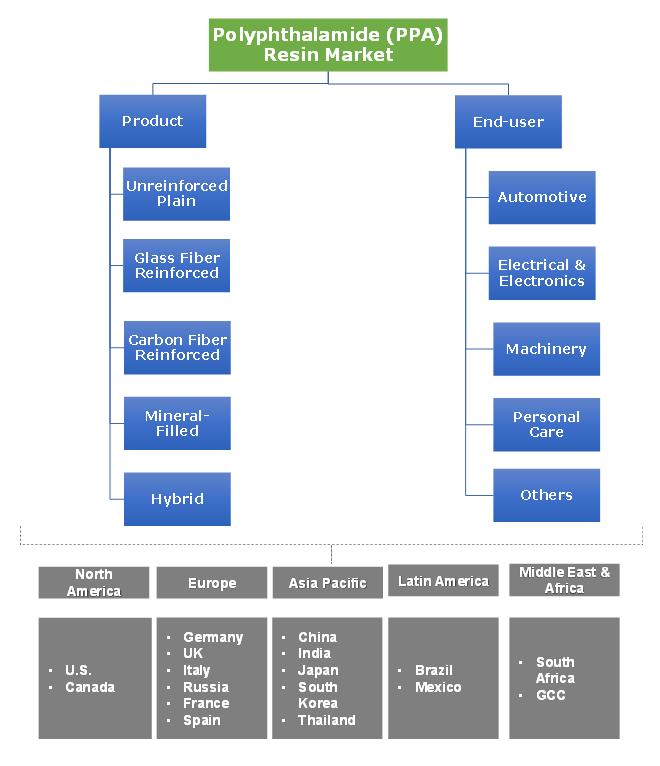 Glass fiber accounted for the largest share in the market and is widely used in automotive, electronics, personal care, and machinery applications. The percentage of glass fiber added in the resin varies from 5-60% and changes according to applications. Carbon fiber reinforced resin has light density and high stiffness and creep resistance, making it fit for automotive and electronics applications. Carbon fiber product is one of the fastest growing segments despite constituting a lesser percentage of the PPA market. Automotive was the largest application for PPA and will continue to dominate the market during the forecast period as PPA can be used to replace metals components. The global automotive industry is forecast to grow by 3-4% annually with China, India, and the U.S. being the front-runners. In electrical and electronics end-use applications, PPA is used in cable sheathing, switches, LED housings, connectors for computers, printers, and reflector sockets. Philips, a leader in LED devices has already replaced its reflector materials by PPA. Asia Pacific dominates the PPA market with almost 55% as it is a huge industrial base of automotive OEM’s and its ancillaries. China is the largest manufacturer of automotive vehicles globally and is expected to retain its position during the forecast period. Also, with the rise in regulations pertaining to the use of sustainable plastics in cars, OEMs of developing countries, such as India, Thailand, and Malaysia, will further shift to metal replacement of plastics, fueling the growth of PPA market. Japan and South Korean markets for PPA are expected to grow gradually owing to the rise in the development of fuel cell electric vehicles. Europe is the second largest market for PPA owing to the presence of giant OEMs such as Audi, BMW, Fiat, Alfa Romeo, Ferrari, and others. The shortage of polyamide 12 owing to the fire at the Evonik’s CDT plant in Marl, Germany in 2012 has led to the development of bio-based PPA resins. As constant innovations are taking place in the automotive plastics market, new modifications in base polyamides can hinder the PPA market to some extent. Some of the major players in the PPA market are Arkema, Solvay, Evonik, DSM, Lanxess, Akro Plastics, and Dow-DuPont, among others. The overall demand for PPA is expected to grow at a healthy rate taking into consideration stringent regulations worldwide on the use of sustainable plastics. Polyphthalamide resin is a high heat-resistant semi-crystalline plastic, which originally belongs to nylon family. It has exceptional heat resistance, which makes it possible to be used in automotive under-the-hood applications along with LED packaging applications. PPA resin is generally modified with glass fiber, which enables it to be used in challenging environments. As the material is widely gaining importance as a metal-replacement plastic, companies in this business have started widening the product offerings that can suit different industries.